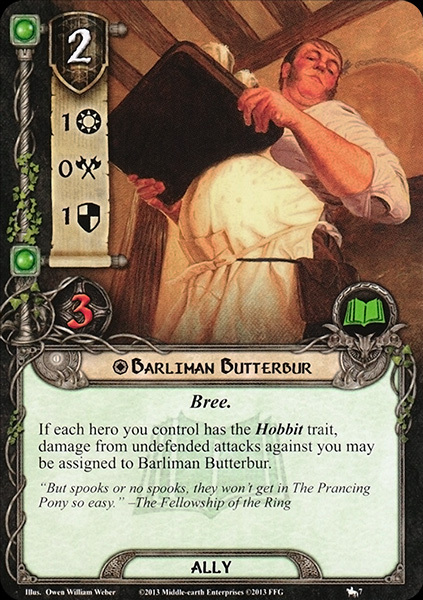 Barliman Butterbur was a Man from Bree, the owner of The Prancing Pony. A short, fat, red-faced Man, he appeared to have had a rather bad memory, 'One thing drives out another' he says. The Prancing Pony in Bree was kept by the Butterbur Family for many generations and Barliman inherited it before the War of the Ring. He had two hobbit employees: Bob, who worked in the stables, and Nob, a servant. During the War, Gandalf wrote a letter to Frodo and told Barliman to send it to Hobbiton. Barliman could not find anyone for the task, and eventually forgot the letter altogether, leaving Frodo uncertain as to Gandalf's fate and causing him to start his journey much later than the letter indicated. 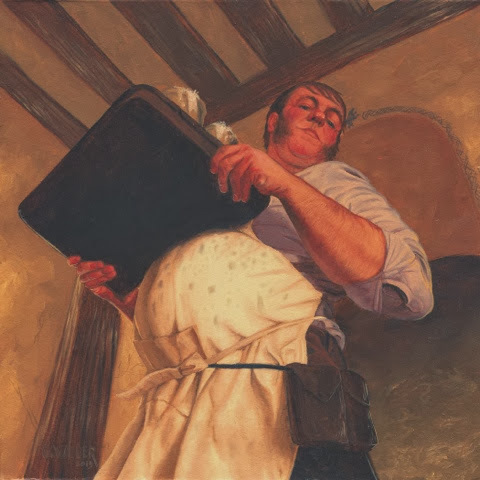 In the first version of the events at the Prancing Pony, written in pencil, the name of the innkeeper was 'Timothy Titus', a name from an old incomplete story by Tolkien (in which the character bore no resemblance to Mr. Butterbur). 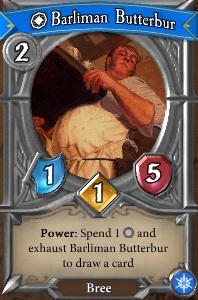 'Timothy Titus' was written over in ink with the name 'Barnabas Butterbur' in Tolkien's manuscript and was created as a very fat Hobbit before he was subsequently changed into the man called 'Barliman'. Barliman means 'barley-man', a suitable name for an ale-brewer.